What now after Michigan, Enbridge agree to deal on Line 5? Gov. 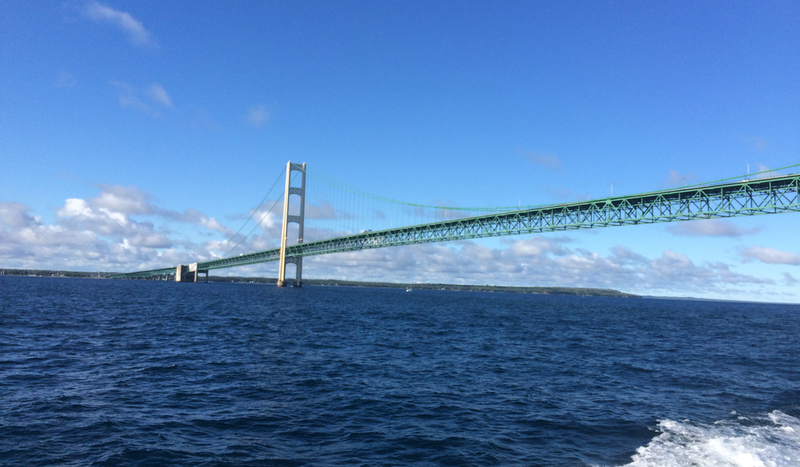 Rick Snyder on Monday adopted an urgent tone in announcing an agreement between the state and Enbridge over Line 5, the 64-year-old oil pipeline beneath the Straits of Mackinac that environmental groups see as a threat to the Great Lakes. “Business as usual by Enbridge is not acceptable, and we are going to ensure the highest level of environmental safety standards are implemented to protect one of Michigan’s most valuable natural resources,” the Republican said in a statement. The agreement follows months of controversy and concern from leaders of both political parties that the pipeline, if not properly maintained, could rupture and create an environmental catastrophe. While the agreement lays out several immediate steps for Enbridge, the pipeline’s Canadian owner, huge questions remain unanswered, including whether Michigan could shut down the 645-mile pipeline that transports 23 million gallons of oil and natural gas liquids each day from Superior, Wisc. to Sarnia, Ont. A shutdown wouldn’t be simple, since the line supplies 65 percent of the propane used in the Upper Peninsula and 55 percent across the whole state. Monday’s announcement has only fueled debate over the state’s handling of Line 5. Replace a piece of the pipeline that stretches beneath the St. Clair River, a vital source source of drinking water, with a new pipe in an underground tunnel – an effort to lower the risk that a rupture would send oil into the river or Great Lakes. Team with the state to examine whether the pipeline could be replaced. A report is due by June 2018. Temporarily shut down the pipeline during certain “sustained adverse weather conditions” that could jeopardize spill response efforts during a rupture. Are environmentalists happy with the agreement? A litany of environmental groups on Monday panned the announcement, saying it falls short of protecting Michigan’s waters, and it puts too much trust in Enbridge. “The state continues to lean heavily on Enbridge to provide critical information when past dealings with Enbridge have proven this to be problematic at best,” Mike Shriberg, executive director of the National Wildlife Federation’s Great Lakes Regional Center and a member of Michigan’s Pipeline Safety Advisory Board, said in a statement. Snyder last month called that lack of transparency “deeply concerning,” even if didn’t “indicate any imminent danger for the Great Lakes.” Snyder’s administration said it will closely watch Enbridge as it assesses the pipeline in the coming months. “We will have state employees who will have full access to the data,” Valerie Brader, executive director of the Michigan Agency for Energy, told reporters Monday. Enbridge acknowledged the trust challenges. “Trust is earned, and while we have a long way to go, we remain committed to doing what it takes to rebuild trust and uphold our pledge to protect the environment while safely meeting Michigan’s energy needs,” the company said in a statement Monday. Would the deal make Enbridge shut down the pipeline in certain circumstances? Yes, but those circumstances are rare. Enbridge agreed to temporarily turn off the pipeline during “sustained adverse weather conditions.” The agreement defined that as whenever median wave heights in the Straits of Mackinac reach 8 feet over an hour-long period. Responding to spills is next to impossible during particularly extreme weather, and this provision would seem to acknowledge such threats. But critics said the 8-foot threshold is incredibly high. Wave heights in the Straits averaged 3 to 4 feet about 24 days each year between 2010 and 2014, according to a 2015 Detroit Free Press analysis of data from National Oceanic and Atmospheric Administration's Great Lakes Environmental Research Laboratory. And waves exceeded 4 feet on eight days each year. Those heights alone could make it difficult for responders to try to contain a spill. The state acknowledges the 8-foot threshold is “not an everyday occurrence, but it’s not unknown in the Straits,” said Brader of the Michigan Agency for Energy. How serious could a leak be? Enbridge has called the risk of a leak miniscule, and a recent state-commissioned report appears to support that argument. Dynamic Risk, the Canadian company that wrote the report, found there is a low risk of rupture from corrosion or other factors. It concluded the risk would barely rise in coming decades. But Enbridge also owned Line 6B, which broke in the Kalamazoo River in 2010, triggering one of the worst inland oil spills in U.S. history. More than 1.2 million gallons of crude oil was recovered during a four-year cleanup and Enbridge has paid nearly $1.3 billion for cleanup and restoration. Estimates vary as to how much water would be fouled by a Line 5 rupture. The Dynamic Risk assessment concluded that a “credible worst case” spill would release about 189,000 gallons of oil that would stay within 60 miles of the rupture and cost about $200 million to clean. When will the state make a final decision on the pipeline? Brader said Monday’s agreement would allow Snyder to make a decision by August 2018. “Shutting the pipeline down is on the table, yes,” she told reporters. Oh great! We get to trust the world's largest reserve of fresh water that is used for drinking water in the entire Great Lakes region to Embridge after the line 6 disaster! And Gov Snyder, whose administration has such a stellar record with drinking water issues [remember Flint!] gets to make the decision in August of next year. four months before he leaves office. Doesn't anyone else see a potential for a major problem here? It appears that all the concern is with the mitigation of a pipeline failure. Is there a list of the possible or probable causes for pipeline failure? If so, where could I find it? The Kalamazoo cleanup is not over and 1.3billion spent, yet the Canadian report says a rupture would take 200million to cleanup. Everything stinks about this report and the government response. The Michigan government doesnt want to shut it down because of the revenue it recieves. How much I wonder? This should go to ballot and let the people have their say. Playing politics with the great lakes is foul play. Evidently, the situation was getting too hot. Recent revelations on lies and cover-ups by the pipeline owner operator required consequences and meaningful action after years of delay. So hot that state officials and enbridge sat down to draw up a backroom deal to Enbridge's liking . an approach that will ensure further delay and ignore the broad support for decommissioning the line. It signals a decision has already been reached on the fate of line 5: a tunnel that will ensure Line 5 will operate indefinitely, just as the company wishes. The Governor's actions blind sided even his own appointed team, the Pipeline Safety Advisory Board, which is the midst of a public comment period. No stakeholders were consulted and the public was not allowed to weigh in. The governor says a final decision on Line 5 will be reached in August 2018 just a few months before the election. That's interesting. Who will ultimate decide the fate of Line 5? The Governor has made it clear, Enbridge will and on their terms. This pipeline should never have been allowed to endanger 95% of the world's fresh surface water. We're told that this is about safety. No one can guarantee an oil pipeline is "safe." There is always risk. Oil pipelines don't belong in the Great Lakes. Period. I think the pipeline should be shut down: too much risk. Find a different way, maybe a different pipeline route. Your math is horribly misleading. Is 23 million gallons the total volume of the long pipeline? Your article suggests that 23 million gallons arrive in Sarnia everyday. You should clarify that.